I've been playing around with the map editor (v9.1), trying to design my own scenario. I gave the opponent AI about 20 militia on base defense, attacking these dudes with my 100 man strong militia army resulted in me being wiped out. I was wondering if there is some buff for soldiers near camps or something that I need to turn off. The same thing happens when the AI sends a scripted attack of militia to my base. He just gets wiped out by a force half the size. The morale drops to about 15% which means about 20 militia are able to take out a 100. What affects the morale, distance to the own storehouse or something? Another dumb question, are triggers working already in the map editor? And can we add typed objectives like in the DarkianMaker campaign? Battlefield tactics matter a lot too. Attackers best bet is to try to surround defenders and hit them from their backs and/or from multiple sides. Defenders best bet is to meet attackers behind narrow passage, face to face and comrades at their shoulder. As you've discovered, morale plays role as well. This is especially critical for Militia, who are weakest troops available early. Morale effect depends on distance from any own or allied house excluding towers and campfires. Triggers already work. You can see how they are rigged in Walkers map. Trigger is placed in the MapEd and is handled in the dynamic script. Objectives are also rigged through dynamic script. Can I access this dynamic script? If so where? I've figured out the scripted movements for units (select unit, tweek group order), The pre-set unit allocations for AI (Village planning -> AI defense/attack)), and that you can designate a trigger area for a unit in the map editor (select unit, ->terrain editor -> trigger -> draw trigger area), but then how do I run a trigger effect? Also, I guess these scripted text pop-ups are in the dynamic script as well? I mean these pop-ups after destroying X amount or specific units? 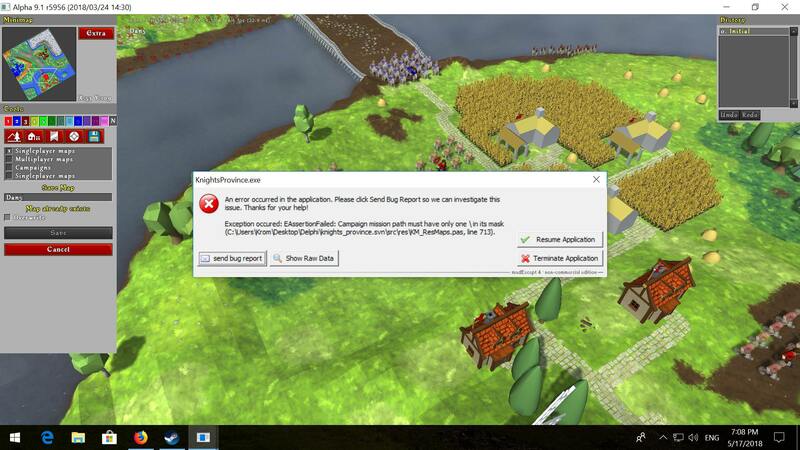 Lastly, If I try to save my map as a campaign, KP prompts an error. Am I supposed to do something different when saving campaigns as opposed to normal single player missions? Sorry about the many questions. Saving for campaign - show me the error please (could be a bug). I'll take a look at the dynamic script today, didn't have the time before. Can you describe steps to reproduce this error? I made a map in map editor. Go to save map. tick the "campaigns" box and I get the error. You can click resume application to continue, but then if you press save you get the same error and it will not save the map as campaign. (i can't remember atm if I saved it as a skirmish map before trying to save it as a campaign, not sure if that matters anyway). but I haven't tried that yet, just been tinkering with my map and the dynamic script atm. There is a flaw in map saving logic. The fix will be in Alpha 10. - save map as singleplayer and move maps folder from "maps" to "campaigns\campaign_name\map_name"